attended the launch of the First Furlong Event at the Ardilaun Hotel Galway. Sharing some of my own pics from the day. 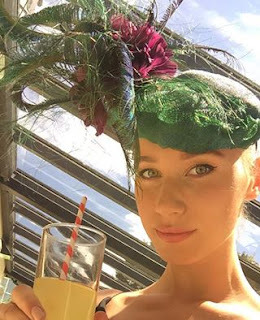 Guests included the Galway Milliners who will showcase at First Furlong 2016. Suzie Mahony Designs, Emily Jean O'Byrne, Catriona King and Majella Dalton. The array of colours for this photo shoot were amazing and made for very colourful pictures taken by Julia from Wonderfulife Productions. Along with the weather and of course the stunning gardens of the Ardilaun. Attending the launch were John Ryan Owner of the Ardilaun Hotel, Maria Kelly - The Ardilaun Hotel who host First Furlong each year. Maria is seen here wearing pinks, black and ivory mix, with a Suzie Mahony Designs Hat. Cora Casserley - Anthony Ryans who are sponsors of the Best Dressed Lady at the event. Cora wore the soft aqua tones and we teamed it with a silk aqua and ivory orchid Suzie Mahony hat. Christine Costello from Breast Cancer Research. First Furlong is in aid of Breast Cancer Research. Probably my two favourite colours Emerald and Cerise Pink so it was very easy to design this silk Suzie Percher hat trimmed with a sharp green feather to match my dress. Ideal summer look for the launch!! With Eliska McAndrew from Catwalk Modelling Agency looking amazing sipping lemonade wearing a Suzie Mahony Peacock trimmed hat in purples and greens. First Furlong will be held on Tuesday 26th July during the Galway Races. Hosted by the Ardilaun Hotel the event is a sell out each year in aid of Breast Cancer Research. Arriving from late morning ladies and gentlemen are treated to drinks reception, lunch, music, amazing raffle and a stunning Millinery Showcase from Ireland's Leading Milliners all from the Capital of Millinery - Galway! !